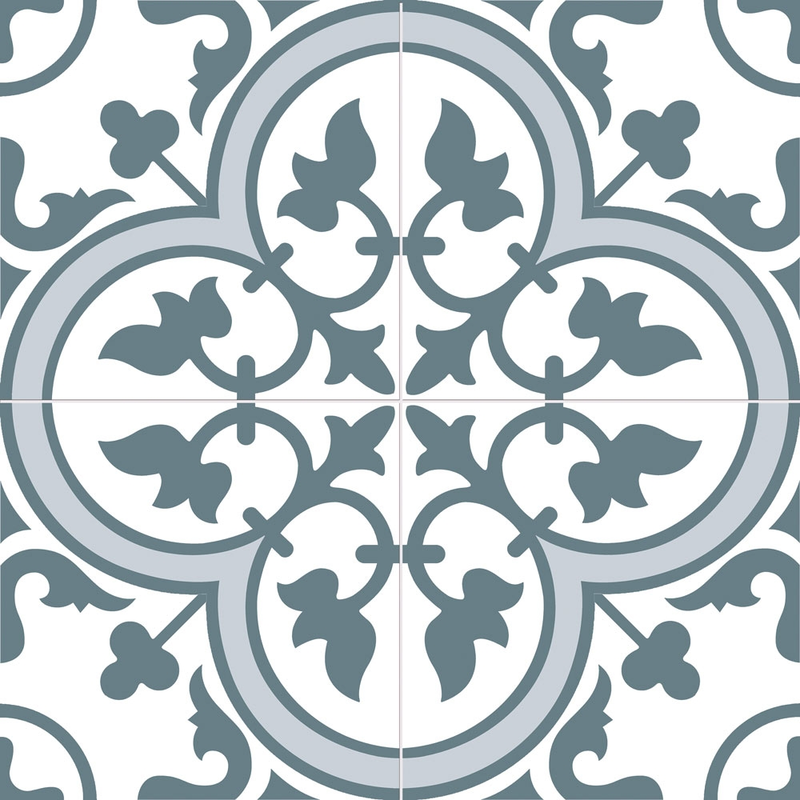 Inspired by the popular encaustic tiles of yesteryear, these Ledbury Marina Blue Pattern Tiles are perfect for introducing a characterful statement floor or feature wall in your bathroom, kitchen, hallway or living area. Made from ceramic, they can be used on both walls and floors and have a charming satin finish. These large format tiles have a grid scored into the surface which you grout into, to give the illusion of multiple tiles. Anti Slip grade is R10/PTV rating +36 in the wet. Want to take a closer look? Sample tiles are a great way to get a feel for a tile's true colour, size and finish. Samples come full size and with Free Delivery. To capture the hallway look shown in the pictures, use our Bond Street Blue Metro 150x75 Tiles on the walls! Lovely finis, but decided on the grey! I've searched for these tiles everywhere, having only found them in black elsewhere, then Facebook recommend them on my feed!!!! Spooky but fabulous! What metro range would you recommend to go with them? We would advise viewing samples before making your final decision, but if you wish to discuss your project in more detail or to arrange samples or a quotation, please call our sales team on 01536 314730 or request a call-back via the link below, and they will be more than happy to help you. Hi there - do these tiles require any sealant or finishing product? Also I assume a dark grey grout is best for the marina colour? The grout colour you go for is entirely down to personal preference, but mid to dark greys do provide a nice contrast to make the design stand out. If you wish to test a few colours, we can provide samples of our Norcros 4 Into 1 Grout range. We would advise obtaining a sample tile and a selection of grout colours to compare before making your final decision. Are the Ledbury tiles suitable as a hearth for a log burner? If you wish to discuss your project in more detail, please call our sales team on 01536 314730, and they will be more than happy to help you. Hey I bought these tiles from you recently what mm Tile spacers should I use? The usual recommended minimum grout joint on a floor is 3mm. However due to the size of the scored grout joint on the tile, to keep them more uniform, a 2mm spacer can be used. If you would like to discuss an order or require any further information, please call our sales team on 01536 314730 and they will be more than happy to help you. Can these tiles be used as part of a walk in shower in a wet room, where the platsic tray will be under the tiles so the floor tiles in the shower will need to be angled downwards to allow for drainage? Or are these tiles too large? These tiles will be fine in a walk in shower. The size should not be an issue as any tiles placed on a Forma tray will need to have whats known as "Envelope Cuts" put in, to allow them to be slanted down toward the drain. These cuts generally go from the outer corners of the tray, diagonally to nearest corner of the drain outlet, meaning tiles of any size can be fabricated to suit the tray. Can you recommend what brand of grout to use for these Ledbury Marina tiles, my tiler was not sure the grout would stay in such a narrow groove. We have just had the ledbury marina blue tiles fitted in the kitchen and they look fantastic! What might be the best way to clean them - i.e can you put the hoover over first? It may seem a silly question but is the background of the marina blue tile white, Ivory or cream? Thank you. Its not a silly question if you don't know the answer. These tiles have a white background but we would recommend obtaining a sample to ensure you are happy with the colour and finish before making your final decision. Being Ceramic these tiles are only intended for internal use. For assitance with ranges that would be suitable for your project, please call our sales team on 01536 314730 and they will be more than happy to assist you. Can these be used on a wall? Albiet mostly used for the floors, the Ledbury tiles can be used on walls. If you wish to discuss your project in more detail, please contact our sales team on 01536 314730 and they will be more than happy to assist you. This is the tile with the green hint to it. The main part of the pattern is predominantly teal but it is hard to distinguish on screen due to photography conditions and screen setup. We would recommend obtaining a sample to ensure you are happy with the colour and texture, before placing your main order. Are these suitable for a wet room floor? The texture of these tiles does give a degree of slip resistance. They have been PTV tested for slip resistance which the results came back with a "Low Risk" rating for wet conditions. We would still recommend a sample to ensure you are happy with the colour and the finish before placing your order.